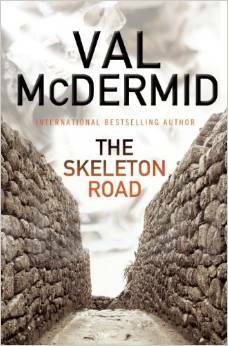 Readers of the blog know how much I love the work of Val McDermid. When I heard earlier this year that she had a new book coming out, I immediately set out to see if I could get ahold of an advanced copy. Only problem, Val told me, was that she wasn’t done writing it yet. Internationally best-selling crime writer Val McDermid is one of the most dependable professionals in the mystery and thriller business, whose acutely suspenseful, seamlessly plotted novels have riveted millions of readers worldwide. In her latest, The Skeleton Road, she delivers a gripping standalone novel about a cold case that links back to the Balkan Wars of the 1990s. In the center of historic Edinburgh, builders are preparing to convert a disused Victorian Gothic building into luxury flats. They are understandably surprised to find skeletal remains hidden in a high pinnacle that hasn’t been touched by maintenance for years. But who do the bones belong to, and how did they get there? Could the eccentric British pastime of free climbing the outside of buildings play a role? Enter cold case detective Karen Pirie, who gets to work trying to establish the corpse’s identity. And when it turns out the bones may be from as far away as former Yugoslavia, Karen will need to dig deeper than she ever imagined into the tragic history of the Balkans: to war crimes and their consequences, and ultimately to the notion of what justice is and who serves it. On a personal note, can I just say how excited I am to see the return of Karen Pirie? I loved this character in A Darker Domain and can’t wait to see what she gets herself involved in this time around. 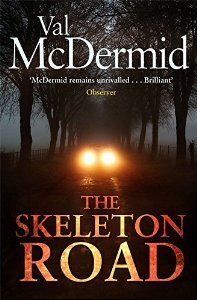 The Skeleton Road will be out in September (UK) and December (US). Mark your calendars!